I made it to Miami, Florida on Saturday, January 8. It was totally uneventful. The only problem that I had was the fact that I had left my coat in my car. I didn’t think I’d need it in Haiti. But, I did need something waiting in the cold jetway. But that was only minor. When I got to the Miami airport, I wasn’t sure how I was going to make it to my hotel. I was told there was a shuttle, but the signs were not very clear. I went outside and believe it or not — I actually ASKED someone. They told me to go back inside and up a floor. So, I did that. Some really short lady pushed the elevator button, so I just walked in. Said something smart — and this woman said, “Greg Yoder.” It was Kathy Redmond, with Compassion International and Dan Woolley, the Compassion guy who was trapped in the rubble of Hotel Montana, in Haiti. I couldn’t believe we ended up in the same elevator. We had a good dinner, laughed a little — okay, a lot. In the middle of dinner I get this strange call from my daughter. She told me that my wife had fallen, hurt her knee and hit her head and she thought she needed to go to the E.R. I couldn’t believe it. Long story short, the neighbor took her to the E.R., everything checked out okay, but she’s really sore. Pray for her. I hit the sack after watch the football game. I woke up in plenty of time. Truth is, I couldn’t sleep much. I get pretty anxious when I travel. I don’t know why. I love flying. I love adventure. Maybe I can’t sleep because I’m excited about it? I don’t know. I was told we needed to get the shuttle to the airport at 7:45am. So, I went down to the lobby early to get a cup of coffee and something to eat. Unfortunately, I wasn’t watching closely enough because my team left without me. No big deal, I just caught the next shuttle and made it to the airport in plenty of time. When I got there, I was told Dan Woolley’s passport was set to expire in March. Typically, you’re not supposed to travel on a passport with your expiration date so close — six months is typical. So, Rich Van Pelt told me if Dan doesn’t go, the team’s staying home. I wasn’t sure how I felt about that. My last trip to Haiti was memorable, but not for pleasant reasons. However, Dan made it through to the gate, security and on to the plane. He even made it past customs in Haiti with no trouble. 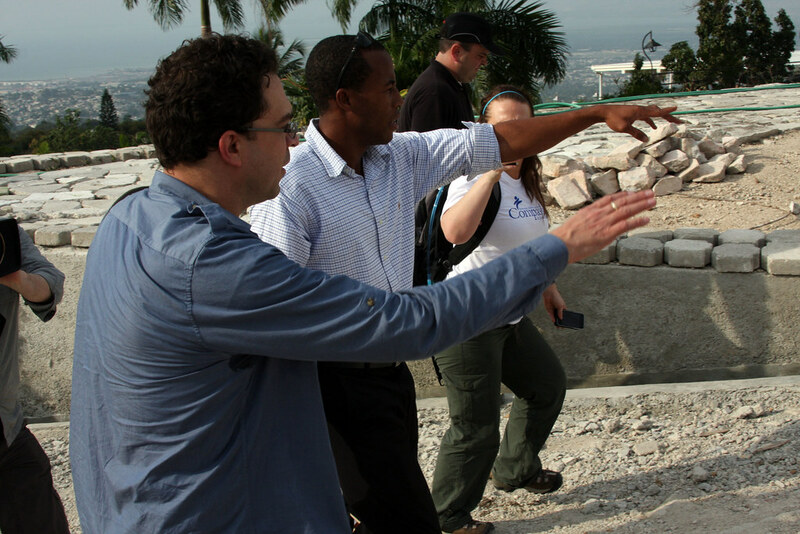 We arrived in Haiti Sunday, January 9. It was a partly cloudy day. Temp was about 80. A far cry from the 12 above in Michigan. From the airport we went immediately to the new Compassion Village. Wow, what a nice place. It’s certainly different the the Haiti Hilton last year. I was in a tent on the parking lot of the Compassion Haiti headquarters. This place is beautiful. It’s three two story homes all in one gated community. It has a generator, air conditioning (when the generator is running), hot water and great cooks. 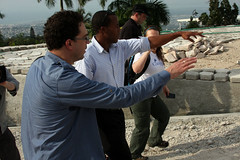 Dan Woolley with Luckson Mondesir at the rubble of Hotel Montana one year later. After our arrival, we quickly got ready to head to Hotel Montanan where Dan Woolley had a couple of interview scheduled with Reuters and AP. In case you’re not familiar with his story, he works in the website department at Compassion. He and his friend, David Hames, were taking a look at Compassion’s Child Survival Program. They had just been let off at the lobby when the 7.0 earthquake started. According to the driver, he thought the hotel collapsed. He looked for survivors, but couldn’t see any. David was killed. But, Dan — by God’s grace — survived with a badly cut leg. He used his Iphone to get his location and managed to find the elevator shaft. There he was trapped for 65 hours. Had he not made the decision to move, he would have been killed in the resulting aftershocks. While trapped, he realized he wasn’t alone. Mondesir Luckson, a hotel employee was also trapped. They were able to encourage each other. They talked, sang and Dan shared the Gospel with his new friend. They were both rescued together. On Sunday, January 9, the pair reunited at on the rubble of Hotel Montana. They shared stories. Dan showed Lukson his new book, “Unshaken: Rising from the Ruins of Hotel Montana” It was an emotional time for Dan. Making it even more difficult, the media following the two around. AP, Rueters, MNN, and the local press all wanted to know how he was feeling. At one point, Dan just knelt near where he thought the elevator shaft was in the rubble and appeared to pray. It was very moving. Personally, It was strange standing there, knowing the dozens of people who died in the rubble of Hotel Montana. People from all over the world perished there. It was an amazing first day. Teen sings, "Hallelujah I have Jesus" one year after losing his mother in the earthquake. the lives of Compassion children, families and staff. The morning was full of praise and worship, testimonies and God’s Word. One young lady shared how she was trying to get out of her house with her sister. The building came down on both of them. Her sister died. She was also trapped. The beams had pinned her head to the ground. After much pain, rescuers got her out. She is a part of the Leadership Development Program, Compassion International’s program to develop new leaders. She took a year off to recover, now she’s decided to become a Christian school teacher so she can have an impact on her country. 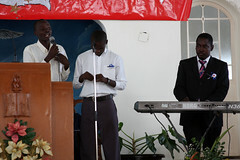 Another young man got up in front of the church. He said, “I lost my mother. She meant everything to me.” Then, he and his friend began singing a song with the lyrics, “Hallelujah, I have Jesus” in the most emotional, convincing way. The day was truly a blessing to me. Unfortunately, I had to excuse myself from a meeting tonight. I’m not actually sure what the whole purpose was. I will find out when the rest of the team gets back. I had to write stories for Mission Network News and Remember Haiti with Compassion special that’s airing Wednesday on stations around the country. By the way, you can catch my Mission Network News reports at http://www.MNNonline.org. Because of bandwidth issues, I haven’t been able to upload any video. So, you’ll have to wait for that until I get home. More reports tomorrow. This entry was posted in Job, Mission Network News, spiritual, travel by christianradio. Bookmark the permalink.